Researchers from Colorado School of Mines have been awarded $2 million in funding from the U.S. Department of Energy's Advanced Research Projects Agency-Energy (ARPA-E) to develop catalytic membrane reactors that could significantly improve the efficiency of both ammonia production and its utilization. "Ammonia, primarily used as a fertilizer, is essential for sustaining an estimated 3 billion people worldwide. However, ammonia synthesis is very energy intensive, accounting for 1-2 percent of global energy consumption, and it's the largest generator of CO2 among commodity chemicals," said Colin Wolden, professor of chemical and biological engineering and lead investigator on the project. "There is a big opportunity to reduce our energy and carbon footprint." Today, the majority of the nation's ammonia (NH3) is produced in large, centralized facilities concentrated along the Gulf Coast. The Haber-Bosch process, which revolutionized the production of ammonia in the early 20th century and continues to be used to this day, requires high temperature and extremely high pressure to transform hydrogen and nitrogen into ammonia. At present, the hydrogen used for this process is generated through steam methane reforming, which accounts for the bulk of the energy requirements and CO2 emissions. "Alternatively, 'green' ammonia would use hydrogen produced via electrolysis of water, powered by renewables such as wind and solar," Wolden said. "However, these resources are distributed and, unfortunately, conventional Haber-Bosch process is not economical at small scale. That's the opportunity we're trying to address — a low-cost, modular approach for distributed ammonia production." The catalytic membrane reactor technology Wolden and his team are developing can be used at a much smaller scale. The team is developing a novel type of porous crystalline membranes for selective ammonia separation, which would allow the reaction to proceed beyond conventional equilibrium limits and lower operating pressures. By integrating synthesis and purification steps into a single unit operation, it is expected to be more energy efficient, as well. In addition to ammonia synthesis, researchers will also be developing catalytic membrane reactors that can decompose ammonia and selectively extract high-purity hydrogen to supply fuel cell refueling stations. "Hydrogen is a clean-burning fuel but its widespread deployment is constrained by high costs associated with its storage and transport. You need cryogenic temperatures and high pressure," Wolden said. "Ammonia, however, is a liquid at ambient temperature and modest pressure. With a large distribution infrastructure in place, ammonia can be efficiently shipped, and then when you need hydrogen, just decompose it." 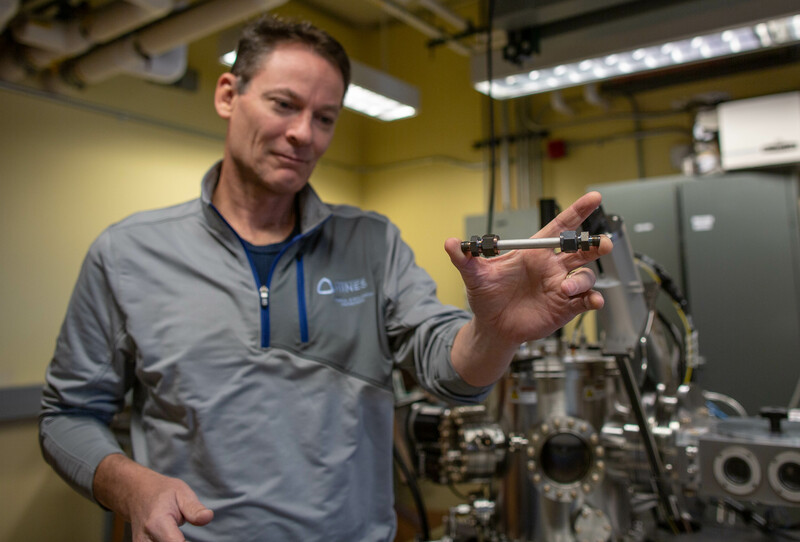 Wolden and his colleagues have already demonstrated their catalytic membrane reactor technology for efficient production of hydrogen at the bench scale, and the ARPA-E funding will allow them to develop a prototype that can demonstrate the technology's scalability. Joining Wolden on the project are Douglas Way, emeritus professor of chemical and biological engineering; Moises Carreon, Coors Development Chair and associate professor of chemical and biological engineering; and John Jechura, professor of practice in chemical and biological engineering. An agreement is also being finalized with a large industry partner. Mines received the competitive award from ARPA-E's OPEN 2018 program, in which teams develop innovative technologies to transform the nation's energy system. OPEN solicitations are an open call to scientists and engineers for technologies across the entire scope of ARPA-E's energy mission.